Blackhawk 603D07CT, 603D07BK Velocity X1 Jump Backpack FREE SHIPPING! The Velocity X1 Jump Backpack from Blackhawk is designed to meet US Special Forces specifications, and can be used for military free-fall jumps. It is made from 1000 denier nylon, and features reinforced seams and double-taped edges for improved weather resistance and durability. Its heavily padded shoulder straps and removable waist belt spread its weight effectively for reduced fatigue, and its two external compression straps allow you to cinch it in when partially filled. S.T.R.I.K.E. webbing across the surface of the pack and belt allows you to attach accessories as required to suit your mission, and the heavy-duty D-rings and eight external tie-downs support even more gear. 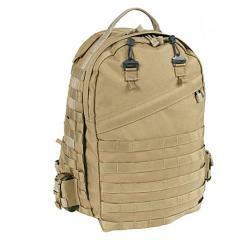 The large main compartment includes four tie-down straps and eight loops for organization and security. It can also be used with hydration systems, supporting a reservoir up to 100 ounces. A front pocket and map pocket provide extra storage space for smaller equipment and documents. ©2002-2019 CopsPlus.com: Blackhawk 603D07CT, 603D07BK Velocity X1 Jump Backpack FREE SHIPPING!